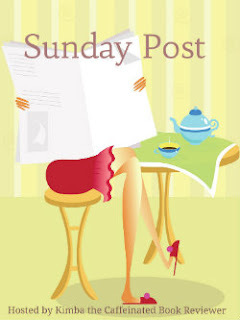 The Sunday Post 1.20.2012. This is probably the closest that I have gotten to completing all that I set out to do. Hooray for me. Monday was my weekly meme, Songs of the Week. I have not included a linky because, apparently, there is only a free trial? I thought it was free all the time. So, please join in by leaving a comment and a link there. This week was a mash up of Les Miserables and Pitch Perfect. Tuesday is always Top Ten Tuesday. This week’s post: Top Ten Settings I’d Like to See More Of. My settings all happen to be in DALLAS, TEXAS! What? This was my first time to join the meme called “Waiting On” Wednesday. The post is to be about a book that you are waiting to be published. I am waiting impatiently for Trish Doller’s second book. Read all about it! Finally, a review. My first this week was for Warm Bodies by Isaac Marion. This wonderful zombie love story has been turned into a movie that opens on Friday. Holla for Feature and Follow Friday. This week the hosts asked: what is the last book that kept you up late into the night just to finish it? Uses for Boys by Erica Lorraine Scheidt. Wow. Feelings are pretty divided on this book, according to my search on the world-wide interwebs. I, for the record, thought it was a beautifully written book about a very sad subject. Looks like all I didn’t do is get my next INKlings interview together and read Sapphire Blue. Which I am DYING to read but it keeps getting pushed back. Other reviews: Talisman of El by Alecia Stone; Sapphire Blue by Kerstin Gier; Splintered by A.G. Howard. Try to remember to get my next INKlings post going! Yes, I am pretty happy with what I’ve gotten! Woot! You have a great week too, K! There are some really great titles you got this week. I adored If I Stay… Happy reading. I look forward to the reviews. Yes, I am very pumped! Maybe I saw If I Stay on your blog? I saw it sometime in the last 2 weeks on someone’s blog. Thanks! I was pretty pleased with what I got this week. God bless eBooks. Have a great week and thanks for commenting! Hi, great selection of books you’ve got there! Have you read Shadowhunters and Downworlders already? And if you have, doesn’t it totally trigger the need to reread the Mortal Instruments Series? Because it did for me 🙂 Oh, and I’m reading Geek Girl right now and it’s so much fun! I started S&D yesterday. Wow! I love the intellectual bent of it – knowing the basis of the types of characters, etc. My daughter and I are reading (me re-reading) City of Bones, because I would like to take her to the movie when it comes out. S&D is definitely making me want to read more deeply. Glad to hear that about Geek Girl – it sounded good! I hope to get to that by March since it already came out. I have a bunch to read before that one. Thanks for reading my post & commenting! Have a great week. I enjoyed Also Known As and Double Crossed, and Splintered is on my TBR list! 🙂 Happy reading! Of course Splintered should be on your list… 🙂 I had a nice Twittersation with the author today. Super nice! I am about half-way through and it is AWESOME. Glad to hear you liked the other two. I’ll be reading them sometime in the next couple of weeks.